The caged duck looked down as terra firma slowly drifted away. Above the duck, a balloon, constructed of paper and fabric, provided the lift necessary to carry aloft the duck and its companions, a sheep and a rooster. Never before had a human, let alone a duck, flown in a balloon. The year was 1783, a milestone year for aviation—the dream of flying had finally been realized. On October 15th of that year, a few months after the duck's historic flight, a balloon, 'Aerostat Reveillon,' launched in France, carrying scientist Pilatre De Rozier, and rose to the end of its 250 foot tether. It stayed aloft for fifteen minutes and then landed safely nearby. A month later De Rozier and the Marquis d'Arlandes flew, untethered, to 500 feet and traveled about five and a half miles in a 20-minute flight, the first 'free flight' made by man. 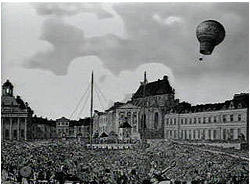 The Montgolfier-designed balloon was heated by a straw fire that eventually caused the balloon to catch on fire, but the two French brothers soon went on to design the first successful, unmanned (and unducked for that matter) balloon. 1785—The First Balloon Across the English Channel: In the early days of ballooning, crossing the English Channel is considered the first step to long distance ballooning. Pilatre de Rozier, the world's first balloonist, is killed in his attempt to cross the channel. 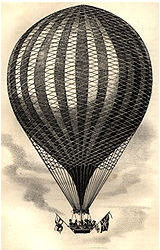 De Rozier's experimental system consists of a hydrogen balloon and a hot air balloon tied together. Tragically, the craft explodes half an hour after takeoff. 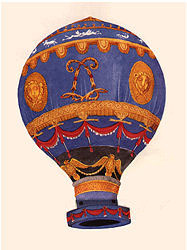 This double balloon helium/hot air system, however, remains among the most successful designs for long distance ballooning. This same year, French balloonist Jean-Pierre Blanchard and American John Jeffries become the first to fly across the English Channel. 1793—The First Balloon Flight in North America: A 45-minute flight from Philadelphia to Gloucester County, New Jersey is made by Jean Pierre Blanchard on January 9. George Washington is present to see the balloon launch. 1794-1945—Balloons Used in Wars: From the U.S. Civil War, through World Wars I and II balloons are used as tools for warfare, for transportation surveying, and communication.